United States Public Health Service Hospital, Carville, Louisiana, 1936. 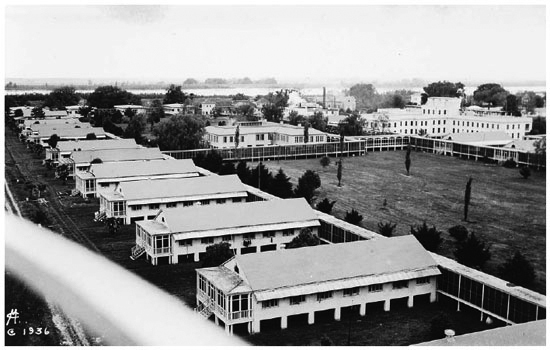 Reproduced here is a photograph of the original wooden structures, taken by Charles Marshall, a patient and photographer, which shows the residential buildings in the foreground and the hospital building in the upper right, all connected by covered walkways. This design was emulated at many institutions around the world in the attempt to provide better accommodations and medical facilities to patients. Even today, some institutions in other countries refer to similar residential dormitories as "Carvilles."